Daily Illuminator: Ogre Sixth Edition Rumbling Into Stores Now! 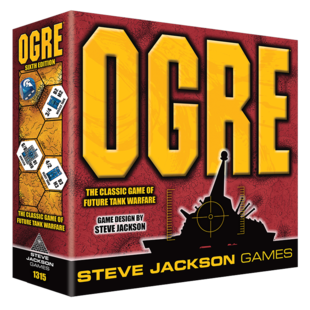 December 22, 2016: Ogre Sixth Edition Rumbling Into Stores Now! Are you prepared for the Ogre's approach? You'd better be, because Ogre Sixth Edition is hitting stores now! Inside the box, you'll find all the supplies you need to play classic Ogre, with awesome 3-D Ogres and Command Posts, as well as full-color unit counters. Giant mapboards can be customized with terrain overlays to make each mission your own, as you roll hits with your new pearl-white dice. I could describe it more, or you could watch our unboxing and see for yourself! Ogre Sixth Edition is the perfect entry-point to gaming for potential wargamers, fans of sci-fi, or even folks who missed out on Ogre Designer's Edition a few years ago. In addition to fast, brutal, and fun game play, Ogre Sixth Edition will open the door to the Ogre universe, which will expand in 2017, starting with Ogre Reinforcements. More units equals more fun! Or it equals more ammo . . . and more ammo equals more fun! Plus, we're starting up Ogre Organized Play in early 2017, where players can hone their skills against the opposition, and win cool gear doing it! Unlock achievements, defend your Command Post, or roll over your opponent's defenses with a mechanical monster, all at your local game shop! Pick up Ogre Sixth Edition at your friendly local game store today, just in time for Christmas! It's the perfect gift for the future general in your life.